San Diego, CA. - Assemblywoman Lorena Gonzalez-Fletcher of San Diego, who is running for Secretary of State in 2022, says she's trying to clear up any ballot confusion that currently exists for NPP voters in California. Unfortunately, AB 681 fails to give California’s 5.6 million NPP (No Party Preference) voters the opportunity to choose presidential candidates. Gonzalez’s bill would provide NPP voters additional information about California’s current and confusing semi-closed presidential primary rules, but fails to provide California’s voters an open presidential primary, as the California constitution requires. In 2015, the Independent Voter Project warned the current Secretary of State that millions of voters would be disenfranchised if the confusing and unconstitutional semi-closed rules were not fixed. IVP offered a simple solution that would provide an alternative “public ballot” that lists every candidate and is open to every voter, regardless of party affiliation. Unfortunately, neither the legislature nor the Secretary of State acted in time to protect the voters. 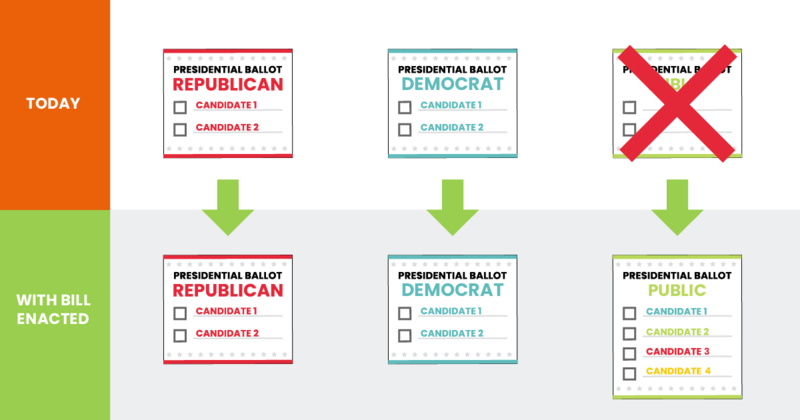 IVP’s solution would have no effect on the Democrat or Republican ballot and the parties would be able to choose whether or not to consider the results of the public presidential primary ballot in choosing their presidential nominee. Bottom Line: Let the parties keep their own ballots. Let the parties exclude or include whoever they want. Let the parties decide their own rules of nomination. But give every voter their fundamental right to participate at every stage of the taxpayer-funded public election process. IVP’s public presidential primary reform has been endorsed by the National Association of Nonpartisan Reformers, representing more than 40 reform organizations from across the country including Represent.us, Chamberlain Project, Open Primaries, FairVote, Let Colorado Vote, California Forward, and Unite America.